Box Office: Ajay Devgn And Parineeti Chopra Starrer Golmaal Again Excellent First Day Business! Golmaal Again starring Ajay Devgn and Parineeti Chopra opened to an excellent response from the audience as well as from the critics. The film received best opening of 60-65% in the morning shows. This is possibly the best opening of any Hindi film this year and also stands in comparison with Bahubali – The Conclusion in terms of occupancy at some of the places across the country. Fans across the nation waited with bated breath for Golmaal Again and it’s great to know that the horror comedy has managed to live up to audience expectations. Rohit Shetty directorial film has put up big numbers on its first day at the Box Office. The film earns Rs 33 crore (330 million) net approx as per early estimate on its first day. That’s not all; the film has recorded highest occupancy ever at multiplexes and single screens. The brand value of the film and the new genre of horror comedy has managed to draw the audience at the theatres. The film has done outstanding business in Gujarat and Mumbai while North India has done moderate business. Diwali holiday has surely worked out in the favour of Golmaal Again. However, the real test of time will start after the first weekend. 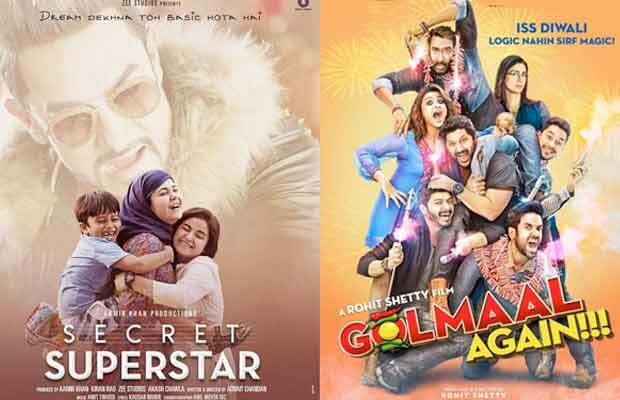 Golmaal Again has released a day after Aamir Khan, Zaira Wasim starrer Secret Superstar hit the screens. If Golmaal Again had got a solo release, the collections would have been over Rs 40 crore. Golmaal Again has an eclectic cast starring Ajay Devgn, Arshad Warsi, Tusshar Kapoor, Shreyas Talpade, Kunal Khemu, Tabu, Parineeti Chopra, Neil Nitin Mukesh, Sanjay Mishra, Johnny Lever, Ashwini Kalsekar, Mukesh Tiwari, Vrajesh Hirjee, Sachin Khedekar, Uday Tikekar and Prakash Raj. Golmaal Again, the fourth instalment of the Rohit Shetty franchise is produced by Rohit Shetty Picturez in association with Reliance Entertainment and Mangl Murti Films. Previous articlePhoto: Sanjay Dutt’s Daughter Trishala Dutt Is Slaying It With A Perfect Figure In This Snap!